Regular readers will recall that last July, this blog was the first to report that former Chief Executive Leo Boland was looking for another job. 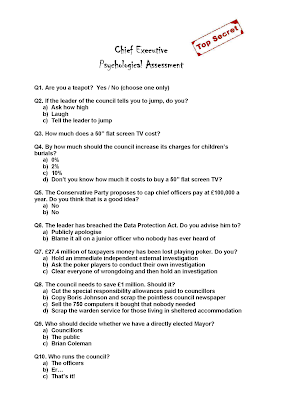 In another exclusive scoop, Barnet Council Watch can now reveal that the cost of recruiting Nick Walkley as his replacement was a trifling £49,395 - inclusive of £3,500 for a psychological assessment. It is obviously very important for an employer to carry out an assessment of someone who already works for them, and lest anyone thinks this is yet another example of the council wasting taxpayers’ money, I have managed to obtain a copy of the secret assessment that Mr Walkley was required to complete so readers can judge for themselves. Has Mike Freer had one? Can't tell if this is a parody or true... if true, how did you get to the figure? The recruitment costs were provided by the council in response to a Freedom of Information request.